Diana Sands, the first black actress to be cast in a major Broadway play without regard to color, was born in New York City in 1934 to Rudolph Thomas, a carpenter, and Shirley Sands, a milliner. Sands made her first stage debut in George Bernard Shaw’s Major Barbara at New York City’s High School of Performing Arts in Manhattan. After graduating from high school, Sands performed as a dancer while seeking work on Broadway. In 1959, she debuted on Broadway as the character Beneatha Younger, a dignified, aspiring doctor in A Raisin in the Sun. Her stage performance earned her the 1959 Outer Circle Critics’ Award and her first film appearance as the same character in the 1961 film version opposite Claudia McNeil, Ruby Dee, Ivan Dixon, and Sidney Poitier. After Raisin in the Sun, Sands was then offered subsequent film roles, but her refusal to be typecast subjected her to less prestigious parts. 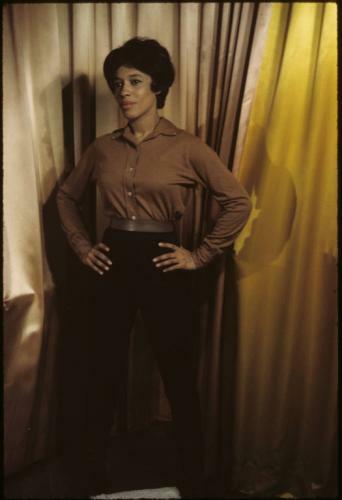 Determined to bypass the industry’s segregated climate, Sands sought to elevate her profession as an actress by performing abroad where she appeared in plays such as Caesar and Cleopatra, Anthony and Cleopatra, and Phaedra. She continued to perform in the United States as well and in 1964 she received a Tony nomination for her role in James Baldwin’s Blues for Mr. Charlie. Sands’s last significant Broadway performance was in the 1969 production of The Owl and the Pussycat opposite Alan Alda. She went on to appear in 13 episodes of the short-lived television series Julia (opposite Diahann Carroll) as Julia’s cousin. Determined to continue her career in film Sands, along with Ossie Davis, Brock Peters, and other notable performers and investors, founded in the early 1970s the Third World Cinema, a company developed to train black performers for every aspect of film production. Third World Cinema produced her cinematic star vehicle Georgia, Georgia, written by Maya Angelou. Sands portrayed Georgia, a confused black woman who becomes disconnected from herself, her people, and the world in her pursuit to find fulfillment as a performing artist. After its release, Georgia, Georgia was considered one of the most controversial films in the black community since Melvin Van Peebles Sweetback’s Baadasssss Song. Her last film Honey Baby, Honey Baby, also produced by Third World Cinema, was released after her untimely death. Third World Cinema also co-produced the major motion picture Claudine, in which Sands had originally signed to play the title role before pancreatic cancer claimed her life in 1973 at the age of 39. Sands died at Memorial Sloan-Kettering Hospital in New York. Anonymous, "Diana Sands In Death Struggle With Cancer," Jet, October 4, 1973; Anonymous, "Final Rites Held for Diana Sands," Jet, October 11, 1973; Maurice Peterson, "Diana, Diana," Essence, June 1972.